It'll have been there for two-and-a-half years. 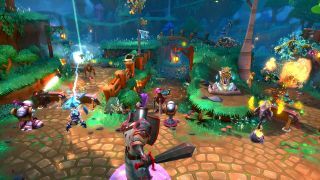 Dungeon Defenders 2, the free-to-play co-op tower defence action RPG—the only thing missing is 'roguelike'— has been in early access since, blimey, December 2014, but developer Trendy Entertainment has announced that it will finally release, for real, on June 20. June 20 2017, just in case there was any doubt. Chris Livingston enjoyed his time with the game shortly after it launched into early access, although more recently its Steam store page has been beset by negative reviews, which are generally complaining about added grind, as of a recent patch. The free-to-play game is supported by several pieces of paid DLC, such as the Hero Army "mega package" that includes two new heroes and a big pile of additional costumes, and that will set you back an eye-watering £75.99. Last year, 2D crafting game Terraria took part in a cross-over event with Trendy's game, which saw new items, enemies, and a new NPC being added to Terraria, from the world of DD2.